As someone allergic to wheat, I’m supposed to not be eating brownies but the things being touted as gluten-free brownies taste terrible to me. I *taste* everything from the soya which I am also allergic to, to the sub-standard chocolate, to the weird flour. I can taste it all and while I rate it against other gluten-free things and so often they taste better than I’ve been subjected to. I decided not to give Paul that out. 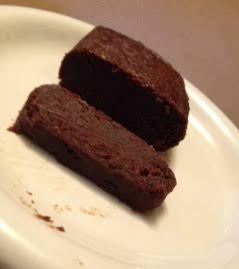 I evaluated Pauls’ gluten free brownie against his own brownie. I expected greatness. I expected fudgy, creamy smooth, amazing taste and mouth feel brownie. I expected a lack of that soy flavour. I expected greatness from these things. I GOT GREATNESS AND MORE. Mine arrived squished in the post so apologies for the questionable photography. I was worried. What was that I detected in the notes in the scent of the brownie? What flour was used? Was I going to be allergic to it anyway with my soy allergy? I cut into it. Well, it looked fudgy and the scent was OK (damn you weird smelling envelope for freaking me out). The brownie was cut differently from the traditional brownie (rectangular rather than square) and the ingredients of even the flour is on the back so fear not – you know *exactly* what you are getting in to. So was it nice? Was it as good as a regular brownie? 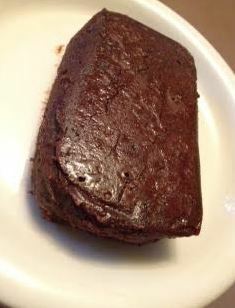 Don’t get me wrong, there is a slightly different mouth texture to this brownie. It probably won’t be noticed by anyone but someone who eats a brownie *slowly* once a week, every week. Not that I’m admitting to that mind you… nooooo…. If you accidentally bought a gluten-free brownie instead of Paul’s normal brownie you’d never know. If you need to eat gluten-free go for it. Buy it with gleeful abandon and shove the whole thing in your mouth knowing you do so with no repercussions later. CHOCOLATE LOVERS – THIS IS NIRVANA!